Learn how to handle a customer’s payment check that has bounced. Here we will show an example of how to enter those transactions. This is the example we will use. Let’s say you received a check for $1,000 and then the bank charged you a $20 NSF fee once the check bounced. Then you received another check from your customer for $1,000. 1. Go the Invoices page. 2. In the transaction history below, find the invoice for which the payment bounced and click on it. 3. Click on the payment transaction. 4. 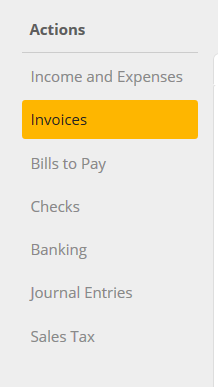 Delete the payment amount from the Amount field. In the Pre-payment, credit, or overpayment field choose your bank account and then enter the amount that bounced (in this case, $-1,000). This will make the invoice unpaid while at the same time creating a $1,000 deposit and $1,000 withdrawal from your bank account. When the bank charges you for the NSF fee, you’ll need to enter that into your books. This is as easy as entering an expense. Enter your date, supplier (use the name of your bank), terms or payment account (your bank account), expense account (bank charges & interest), price (in this example $20). When you receive payment from your customer, enter the payment as you would any other invoice payment. Go to the Enter Payment tab. Enter your date, client name, payment account, and amount paid. But I want to charge my customer for the NSF fee! In this option, you will edit the invoice so that it includes that $20 NSF fee. It’s as simple as adding an additional line item for the fee so that the total invoice comes out to $1,020. Once you add the fee to the invoice, you can collect the payment using the Enter Payment tab as you normally would for any invoice. In this option, you add the extra $20 NSF fee when you enter the payment, instead of editing the invoice. So, the invoice remains $1,000, as seen below. Fill out the payment as you would any other payment, but in the Pre-payment, credit, or overpayment field enter the amount of the NSF fee (in this example, it is $20). But what account do I attribute the NSF fee I received from my customer to? In our example, we attributed the NSF fee paid to the bank to the “bank charges & interest” expense account. So, when you customer pays you back for the NSF fee, you can also attribute the money received to the “bank charges & interest” expense account. The NSF fee paid to the bank will cancel out the NSF fee received from the customer. However, the account to use depends on how you want to account for the charge paid out to the bank and the money collected from the customer. You may want to consult with your accounting professional on which accounts to use.